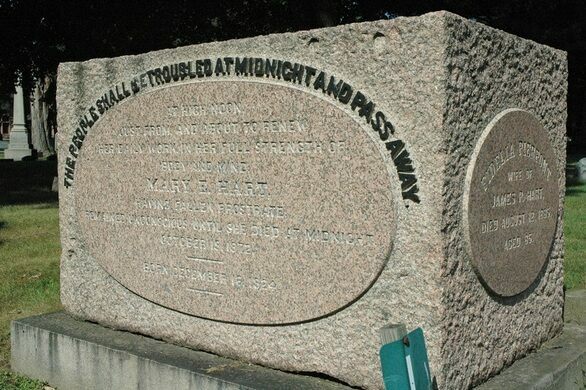 In life, she was known by the name Mary E. Hart, but today most people in New Haven, CT, know her as Midnight Mary. The story goes that Mary was accidentally buried alive after a swoon. One of her relatives then had vivid nightmares about Mary and had her body exhumed. Upon doing so, the exhumers found grisly confirmation that Mary had been buried alive. Of course, there’s no documentation that this ever happened, but the story seems to have started from her epitaph. The phrase is from book of Job in the Old Testament and, in context, is just a statement about being resigned to fate. However, over the years, locals and spook story spinners have interpreted that phrase to mean that Mary hated the world enough for burying her alive to curse it with her final epitaph. Anybody caught in the graveyard after midnight or who desecrates her grave would die shortly thereafter. To find this grave: Upon entering the cemetery, take your first available left. Keep going until you can't go further and see the fence that parallel's Winthrop St. Turn right, keep going until you see the old gate to Winthrop St on your left. (This gate is no longer operational and is locked.) Once you pass the gate, the grave will be on your right. There is a stone marker in front of the grave that reads "50" and another "51" if the stone markers go past these numbers you have gone too far.